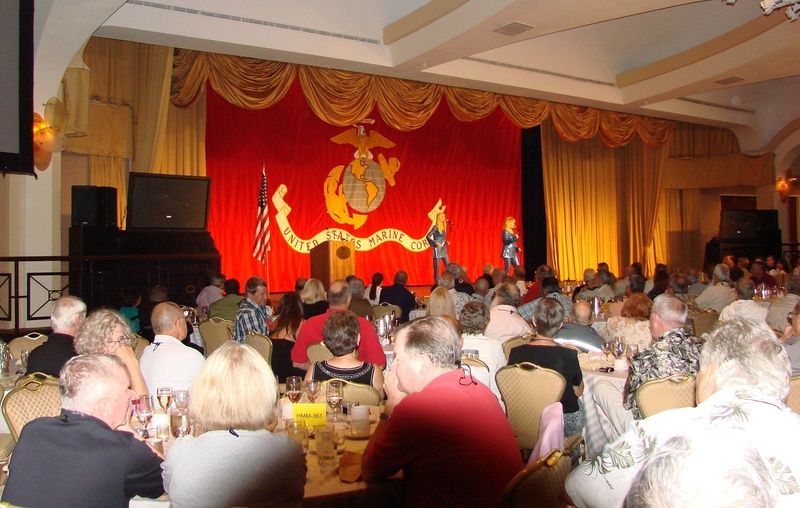 They went gung ho for Blue Eyed Soul in our nation’s capital last week, as our two favorite blonde bombshells rocked a packed house of cheering Marine Veterans and other invitees in one of the biggest and most renowned banquet halls in North America. DECORUM, SPIT AND POLISH…WITH A FEW SMILES THROWN IN FOR GOOD MEASURE: It was nothing less than white glove treatment for LINDSAY BLOOM (above left) and MICHELLE DELLAFAVE (above right) upon their arrival in Washington, DC last week, as they were met by two proud (and lucky) Marines, who escorted the leggy lasses to the gate of the Marine Barracks for the Friday Night Parade, a weekly summertime ceremonial tradition featuring the USMC Band and Silent Drill Team. 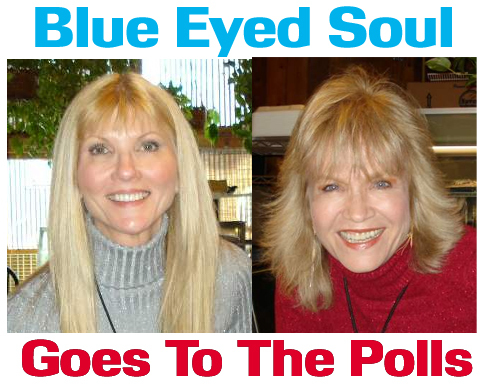 DOWNTOWN D.C. (BY WAY OF HOLLYWOOD & VINE): The Blue Eyed Soulstresses bring a touch of Tinseltown to the more staid streets of Washington. It was a far cry from chowing down in the mess hall when over 1,500 U.S. Marine Corps Vets and their guests, attending a reunion organized by the USMC Combat Helicopter Association, filled the International Ballroom of the Washington Hilton last Saturday to dine and be entertained by the evening’s star attractions: Michelle DellaFave and Lindsay Bloom. Those two vivacious vets of The Dean Martin Show not only drew a thunderous ovation from all hands present, but also made a little history of their own by performing before the largest audience that any members of The Golddiggers or Dingaling Sisters have played to since the two groups’ final overseas USO tour with Bob Hope back in 1970. LOOKING FOR A FEW GOOD MEN…WOMEN…AND THEIR KIDS: How does 1,500 of them grab you? That’s how many showed up — and stayed all the way through — to watch Michelle and Lindsay perform last Saturday night at the big Marine Combat Helicopter Assn. Reunion Banquet. The first picture above shows one side of the ballroom at the Thursday night welcoming dinner. 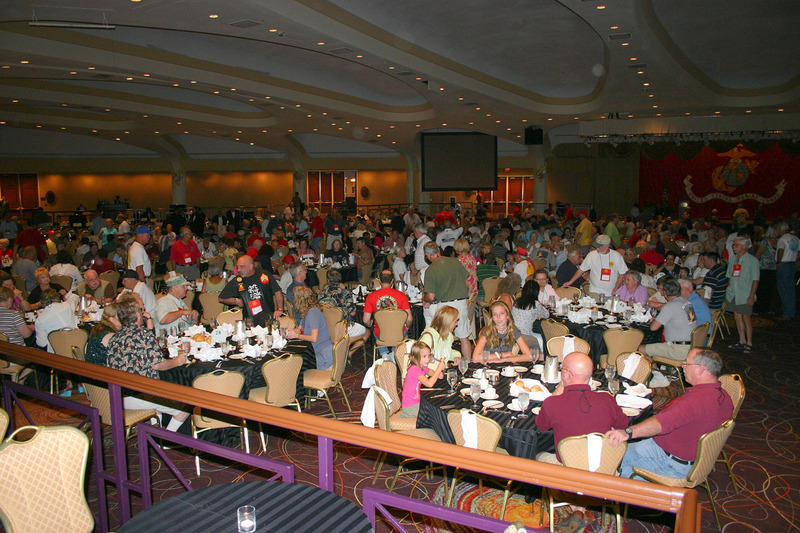 The shot below is of the same venue two nights later, as a sea of tables packed with patrons takes in the Blue Eyed duo on stage (click on the image below — or, for that matter, any other in this post — to see a larger view). 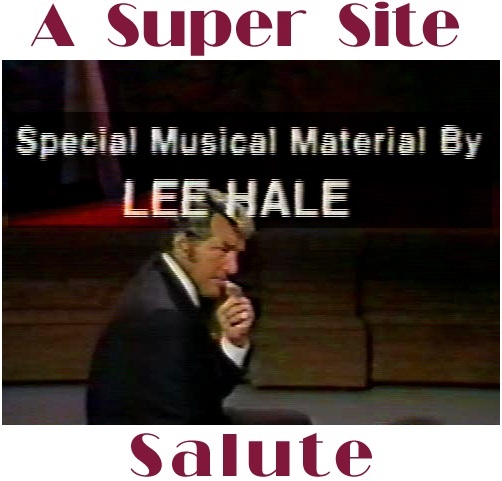 There were many in the audience at last Saturday’s affair who had caught one or more of the Bob Hope USO shows during their own tours of duty in the late ’60s and early ’70s, and who carry with them to this day fond and eidetic memories of those gorgeous, talented gals from back home who treated them to a fleeting but oh-so-precious respite from the rigors and realties of everyday military service. 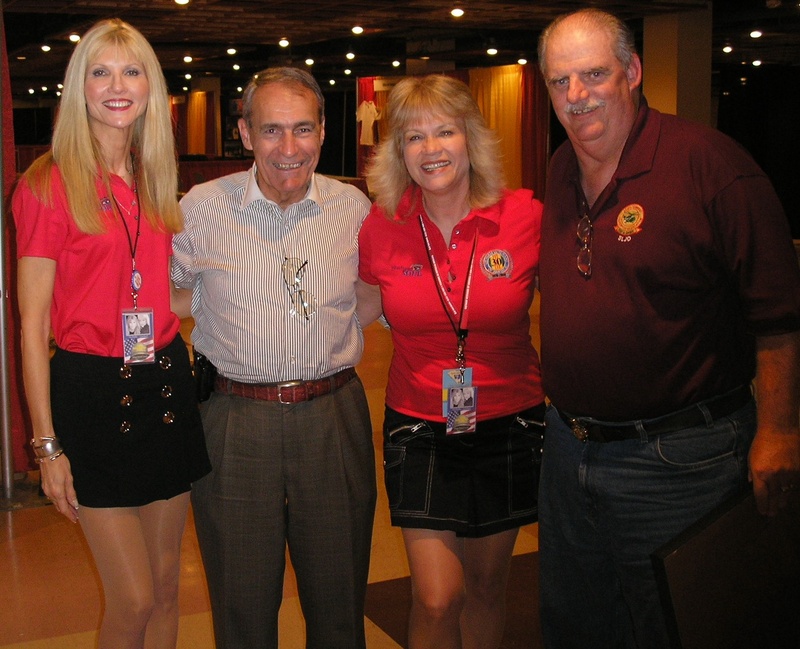 In fact, the man chiefly responsible for putting together this 2008 Reunion, Marine Vet Larry Zok, has his own still-vivid recollections of helping Michelle off a helicopter in Danang back in 1970 (for background on that event, see the photo and caption in our earlier story, Answering The Call). AT EASE: Michelle and Lindsay lock arms with: (left) three-star Lt. General (ret.) Fred McCorkle, former Deputy Commandant for Aviation at Marine Corps Headquarters in Washington; and (right) Marine Vet Larry Zok, the man in charge of this year’s USMC Combat Helicopter Assn. Reunion. It was actually a chance meeting with Michelle, Lindsay and Blue Eyed Soul’s Manager, Wes Guidry, at Memorial Day ceremonies in May that brought Larry and Michelle together again after 38 years, and led to the invitation to perform at the Reunion dinner this past weekend. And by all accounts, the two glamorous headliners at that gathering lived up to the memories of those in attendance and the legend of their girl-group roots. Opening with “Gotta Get You Into My Life”, they kept the audience riveted throughout their briskly-paced 40-minute set, and finally brought the crowd to its feet (as well as many in that crowd to tears) with their closing rendition of “God Bless America”. BOOT CAMP: The girls step lively, and even work in some high kicks, as they march to a funky beat with their own interpretation of Nancy Sinatra’s 1966 classic, “These Boots Are Made For Walkin'”, that feels fresh, yet still manages to pay homage to the original. After the show ended, the past President of the organization hosting the event confided to BES Manager Wes Guidry that even though he had booked some top-drawer celebrities (who shall herein remain nameless) for a previous reunion engagement, most of the audience at that earlier show left by intermission. Needless to say, there were no such desertions at Michelle and Lindsay’s performance: When the lights came up, every seat in the house was still occupied. 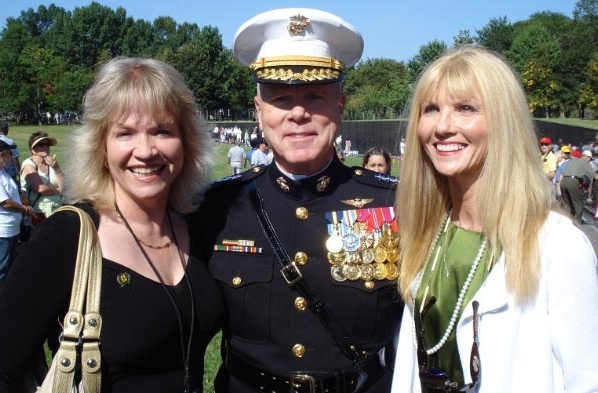 TOP BRASS AND TENDER SOUL: It never hurts to have friends in high places, which Lindsay and Michelle demonstrate de novo, as they flank four-star General James F. Amos, Assistant Commandant of the Marine Corps (the second highest ranking officer of the USMC). 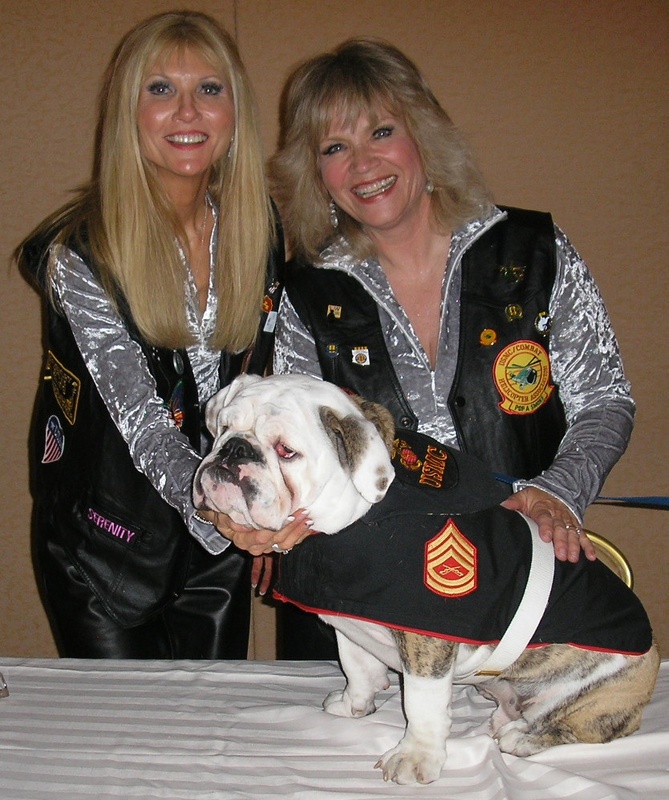 SEMPER FIDO: After a busy session signing autographs, the girls were beseeched with one more request. Apparently, there isn’t a Marine to be found who doesn’t want to get next to these two. Of course, the gals make trips like this latest one to Washington not just to entertain and honor those who’ve served their country, but also to bring affirmation and comfort to those sometimes-overlooked casualties of war — men and women in uniform who have been wounded in combat. Visits to VA hospitals have been a regular part of Michelle and Lindsay’s itinerary since they signed on with Blue Eyed Soul last November, and following in the footsteps of their Memorial Day trip to D.C. in May, BES Manger Wes Guidry used the occasion of the day after this past Saturday’s banquet to bring the ladies back to D.C.’s VA Medical Center, where, among other patients, they were once again able to spend time with Corporal John Lake, a victim of traumatic brain injury while stationed in Iraq. During their first go-round in May, the girls had developed a special bond with this brave young man (and he, with them — see Answering The Call). And so it was deeply heartening to both Michelle and Lindsay, upon seeing John again, to discover how much progress he had made over just the last two-and-a-half months. ON THE WAY BACK: Revisiting Corporal John Lake, whom they had first met last May at the VA Medical Center in Washington, Lindsay and Michelle found the Iraq War Vet, having suffered a traumatic brain injury in combat, still struggling to recover, but greatly improved since the last time they saw him. Along with Wes, Larry Zok was also on hand for this visit. And while acknowledging what a thrill and success it had been having Michelle and Lindsay for the Saturday night shindig, seeing the difference that these two beautiful souls made in the lives of the heroes that they touched in that hospital last Sunday made Larry realize that it was there, with those patients, that these gals’ greatest service and truest mission were at once fulfilled. …and one last Eskimo kiss (shhh…don’t tell the nurses). 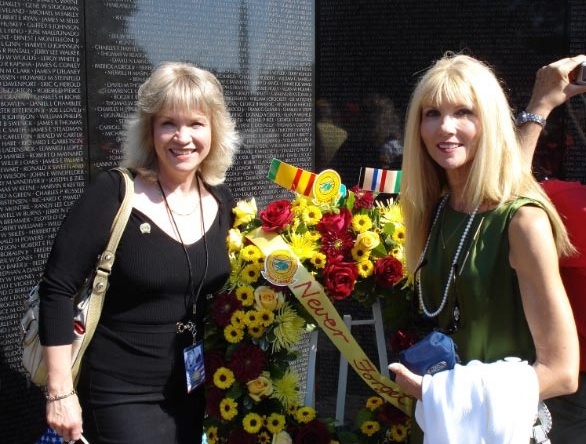 A MOMENT TO REMEMBER AND REFLECT: Lindsay and Michelle stop by the Vietnam Veterans Memorial Wall to lay flowers and pay their respects, as they’ve done every time that Blue Eyed Soul has come to Washington. We wanted to take just a moment here to note that around the time that Michelle and Lindsay were setting an attendance record in Washington last weekend, The Golddiggers Super Site was marking a milestone of its own — logging its 50,000th visitor since we first opened our doors (virtually speaking) a little over a year ago on July 27, 2007 (the actual number of people who’ve viewed the site — including repeat visits — is 51,043 as of this writing, according to statistical data supplied to us by our website hosting provider). We want to thank all of those who’ve passed through these doors (again, virtually speaking) over the last year, and let fans of The Golddiggers, The Dingaling Sisters and Dean Martin everywhere know that we have many more interesting and exciting features on tap for both the near- and long-term future — including more audio and video goodies — as we look forward to the coming year…and our next 50,000 guests. Our thanks to Wes Guidry for furnishing most of the photos appearing in the foregoing story, and a special thanks to Greg Hughes for coming up with the one that was hardest to find. Dozens of additional shots of Michelle and Lindsay, as well as other highlights from the 2008 Marine Combat Helicopter Association Reunion, plus over two hundred vintage and recent pictures of The Golddiggers, Dingalings and Dean Martin — and exclusive links to content available nowhere else — can all be found at the home of the GoldsAndDings Group, which requires no fee to join and no obligation after enrollment (other than to have fun). This entry was posted on Friday, August 22nd, 2008 at 6:17 am and is filed under Uncategorized. You can follow any responses to this entry through the RSS 2.0 feed. Responses are currently closed, but you can trackback from your own site.